This Cheesy Rice Stuffed Mushrooms Recipe is great for a side dish or ideal for entertaining as an appetizer! 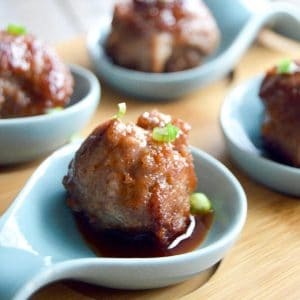 Elegant gourmet bite sized servings make them a go to recipe for any occasion! 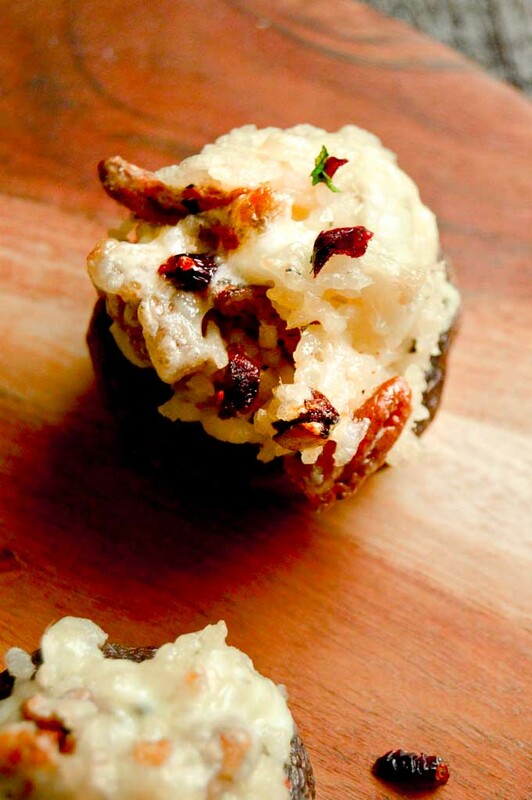 Cheesy Rice Stuffed Mushroom Caps are an easy recipe that seems much more haute cuisine or gourmet than they are. 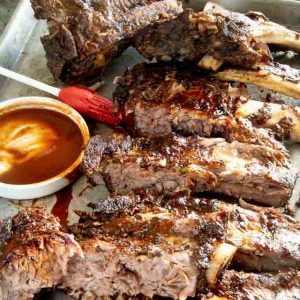 Bite sized portions are great for entertaining with ease. My husband is from Minnesota and we have a house up on a lake in northern Minnesota that someday soon we will move to and leave behind the hustle and bustle of California. In the mean time, we get up to the lake to relax and work on getting the house ready for our arrival. When we’re there we go out to eat to a lot of restaurants and todays post on Cheesy Rice Stuffed Mushrooms is inspired by what we had at a local restaurant. 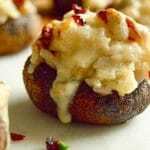 These easy stuffed mushrooms are earthy, tender and juicy with each bite having the melted cheese swirled around the rice with the flavors of fall…. nuts and cranberries. What kind of mushrooms should you use for a stuffed mushrooms recipe? For a side dish or an appetizer you’ll want to look for baby Bella (or crimini) mushrooms. They are the smaller version of a Portabella mushroom. The larger portabella is more suited for the entry/main course part of the meal. This recipe will work either way you’d just have to cook the larger mushroom longer. As you can see many things work well in mushroom caps. You can create a simple rice and cheese with some fresh herbs or make them very gourmet by using crab with a fontina cheese. The best stuffed mushroom recipe Ive made for fancy parties is with Lobster but during football season I’ll make a sausage and cheese filled bite for watching the games. Clean the mushroom caps by using a damp paper towel to wipe them down. Sauté aromatics ( garlic, onions, herbs) until cooked. Prepare the rice cheese mixture, add aromatics to rice. Brush the caps with butter. Using a small spoon or your hands prepare a small amount to fit into the cap. Sprinkle some additional cheese over the top. Bake until mushrooms are sizzling and cheese is melted. Can you make stuffed mushrooms ahead of time? You can prepare them up until the baking step and place them in a sealed container in the fridge until you are ready to bake. Ideally you will remove them from the fridge to allow them to come to room temp before baking them. Allow at least an hour so the mushrooms and filling can cook thoroughly to hot in the 25 or so minutes. Cooking the mushrooms longer than that the mushrooms will soften too much and you wont be able to pick them up without them disintegrating. Cheesy Rice stuffed Mushrooms are ideal for entertaining because you can make them ahead of your guests arriving then pop them in the oven just before they arrive. The scent of the mushrooms softening, cheese melting and the garlic and herb infused rice will make your home smell so wonderful as your company arrives. Easy/Hard: Very easy. Cook the rice, stir with the seasonings and cheese and put it in the mushroom cap! Can it be any easier? Options: I suggest using a 2- 3″ mushroom to make these, but you can make these for a side dish too and get a large portobella mushroom to stuff. You’ll only need to adjust the cooking time. Adaptions: Use your favorite cheese instead of the gouda that I used, it works with any cheese. You can switch the nuts and even switch to dates or figs. You can also make a meat filled mushroom by using pieces of sausage or pepperoni in the rice. 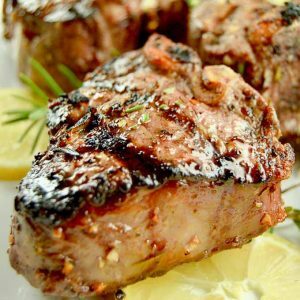 Pairs well with a good cold beer (great for football season) Prosecco (fun for the holiday parties) or even a Pinot because it works well with the gouda cheese and smokiness of the cooked mushroom. Looking for other appetizers to pair with the mushrooms this fall and holiday season? I have recipes for Smoky Shrimp on Potato Nests , a Bacon Filled Stuffing Cups and Sweet Potato Starter Bites that give you more options for any entertaining! If you are looking for a more gourmet dip be sure and check out Lemon Blossoms Hot Crab Dip here! 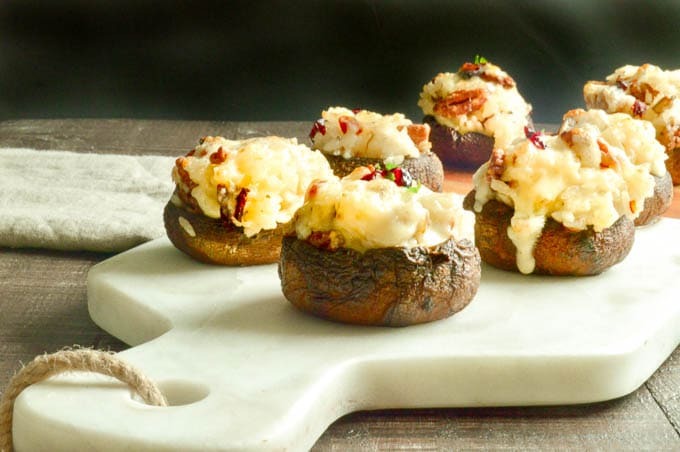 Cheesy Rice Stuffed Mushrooms: Melted cheese stirred into rice with pecans, cranberries all stuffed into tender, fresh mushrooms an appetizer your guests at any holiday party, football viewing or just for a Friday Night snack. (Cook rice according to instructions on rice package). Place hot cooked rice into a bowl and set aside. Using a damp paper towel wipe any dirt from the mushrooms. Remove the stems from the center carefully trying to not rip the mushroom cap. If the stems are not dried out and wood looking, mince them into small pieces and add when cooking the onion and garlic for additional flavor boost. In oven proof skillet, heat pan to hot, then add 1 tablespoon olive oil and saute garlic and onion until translucent Add minced mushroom stems here is using. (about 3 minutes.). Add thyme and stir to combine for 1 minute. Remove skillet from heat. Stir onion/garlic mixture into rice mixture. 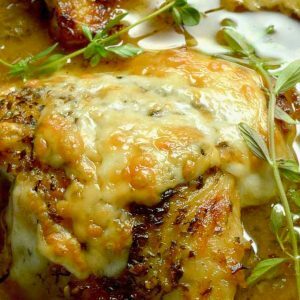 Set aside about 2 tablespoons of gouda cheese. Stir rest of gouda cheese, cream cheese, cranberries and pecans into the rice. Brush the tops of the mushrooms with the tablespoon of melted butter. Then divide rice mixture evenly (just a little less than a tablespoon each) and spoon in rice mixture into mushroom cap. Place mushrooms, cap side down, filling side up back into the same skillet you cooked the onions and garlic in. These mushrooms were a big hit at our cocktail party. Pure cheesy perfection. Love the sweet little bits from the cranberries and the crunch from the nuts. Will definitely be making this easy and tasty appetizer again! 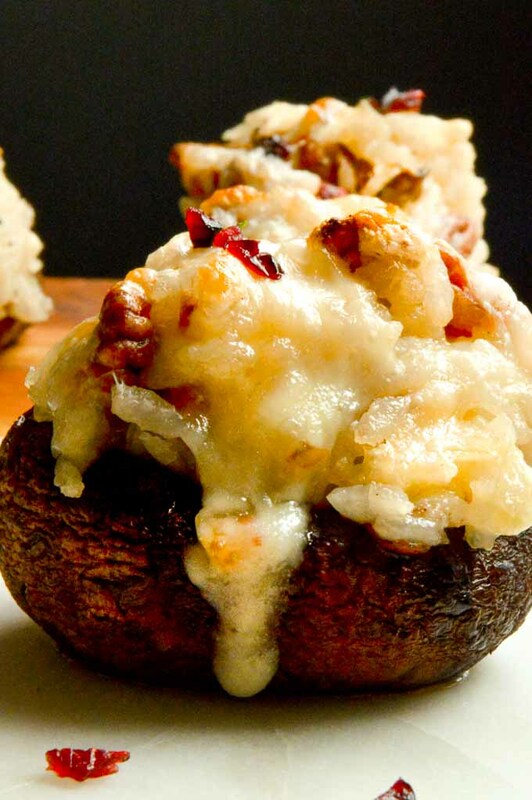 Love the cheesy flavorful filling in these mushrooms. Great appetizer! My son lives in Minnesota and loves it there, we’re from the south so the snow is still a bit of a novelty for him, I think. These mushrooms are fantastic! So easy to make and full of so much flavor. This recipe is headed to my recipe box so I can make it over and over again! Wow! What a wonderful thing to look forward to in the future. As for these mushrooms. . .well. . .they look so lovely and really do make for the perfect appetizer. The flavors remind me fall…which just so happens to be right around the corner (she says with disbelief). My husband is a Minnesotan too! His family still lives there, but given the chance to get away from those brutal winters, he relocated to sunny South Florida! 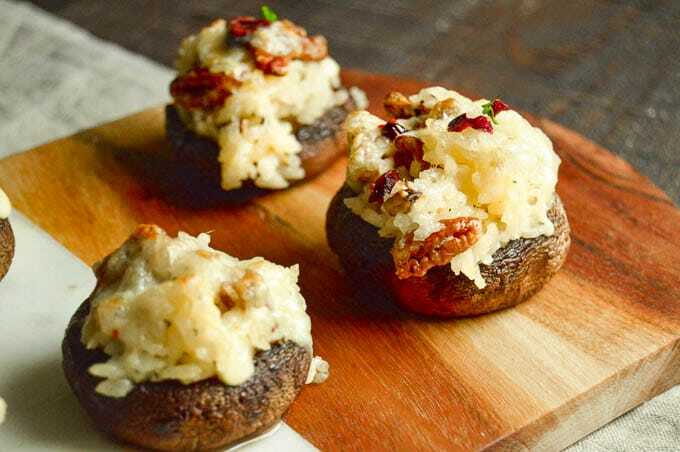 Love this idea for stuffed mushrooms. They look fantastic. Anything with melted cheese is the perfect food in my book! YUM! Looks so delicious. Now I know what I will be making for upcoming football parties!